I know this isn’t meant to be a body image quote, but allow me some creative license here, as I’d like to speak of it in that context. When I think of all the bad things I’ve done to my body (and my mind) during the years of my disordered eating past, it makes me sad. Beating myself up for an extra cookie, talking and thinking about food and fitness 24/7, doubling up at the gym to “make up for XYZ,” changing social plans to not miss a workout, not allowing myself to enjoy a glass of wine at a work happy hour because of the calories, those were all par for the course back then. And it is so sad to me now that I lived that way … and, worse, for so long. I realize now that I didn’t love myself then; I thought I did, but I didn’t. How could what I did to my body be viewed as love? Love involves forgiveness, respect, adoration … I had absolutely none of that for myself. Back then, my self-worth was wholly tied to the tag inside my jeans and the number on the scale (which I had to check every morning). And as I went down that ugly path of self-loathing, I became selfish and hyper-critical; judgmental and even a little bitter at times. Thin, fat, heavy, skinny … we all live and we all die. How we live matters most. And, at my worst … I wasn’t living. Period. In thinking about this today (a dreary, rainy, gloomy Thursday), I see now that as I gained back some of the weight I lost in 2004, my soul got fuller again. Happier. Yes, I was heavier — yet I felt lighter (and more enlightened, if that makes any sense). The bitterness had dissipated (now I’m proud to see people lose weight successfully instead of being jealous); the judgmental and critical thoughts went away. I started to enjoy the things I used to fear: certain foods, meals out, drinks, desserts. Fitness became genuinely fun — not something I obsessively-compulsively-had-to-do. I’m not saying all this transpired in a good way; it was a pretty ugly and painful process for me to get to where I am today and I wouldn’t wish this journey on anyone. But in retrospect, what’s come out of it has only been good. I feel like I’m at a place now where my mind, body and soul are all speaking the same language. We’re in sync. This body, with all its assets and flaws, is on loan — all of our bodies are on loan. But who we are on the inside matters more. That’s the legacy we leave behind. How often at a funeral do you hear someone talk about how thin/fat/heavy/scrawny someone was? NEVER. You hear what a good soul they were: a warm, caring person; a good leader; a strong man/woman; a brave person; a funny friend. Truly, our soul – the essence of who we are — is what others will carry with them long after we are gone. So let’s not waste another single moment berating our bodies and focus on being good people, on being good souls. Here’s some more understanding about what your friend sent to you, I think you would like to know. It’s taken from the word of God. See in the scripture below it starts with the real person our spirit. I Thess. 5:23-I pray your whole spirt, soul and body be perseved without fault till the coming of the Lord. 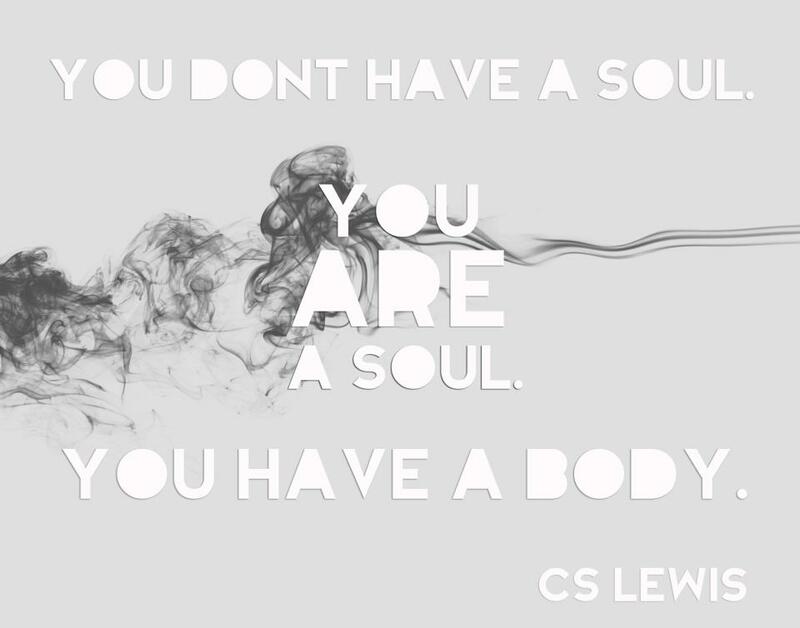 We are a spirit, we have a soul, and we live in our bodies. Our spirit is the real us, as the bible says without the spirit our body are dead. lIke in the word where it says, to adsent from the body is to be present with the Lord. Also in closing I have enjoyed and do enjoy all your news you share has been delightful, I too once lived an eating disorder, that’s how I learned about your life, thank you for sharing from your heart, and soul to each of us. I am in the middle of doing a newsletter so kind of in a hurry, hope to hear from you.